Absolutely the best and most reliable option for controlling watermeal and duckweed. 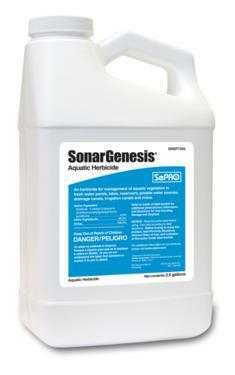 Genesis is a new formulation recently released by Sonar and is dramatically less expensive than Sonar AS. It works every bit as well, and has even been found to work quicker than AS to achieve control. Like AS, it provides long-lasting control. We no longer sell Whitecap due to quality control issues since the product began being manufactured overseas. Sonar is made in the U.S. and it will absolutely zap your watermeal or duckweed!